Cosmonaut Yuri Malenchenko, Expedition 16 flight engineer, aboard the International Space Station used a digital still camera to record several images of the Jules Verne Automated Transfer Vehicle (ATV) during a rendezvous test. Backdropped by the airglow of Earth’s horizon and the blackness of space, the Jules Verne Automated Transfer Vehicle (ATV) approached the International Space Station on March 31, 2008. The European Space Agency’s (ESA) Automated Transfer Vehicle-4 (ATV-4), an unmanned cargo freighter, lifted off on an Ariane 5 rocket from Europe’s spaceport in Kourou, French Guiana at 5:52 p.m. EDT (2152 GMT). The second to last of ESA’s five planned station resupply spacecraft launched since 2008, ATV-4 was named “Albert Einstein” after the iconic physicist known for the theory of relativity. Einstein’s theories have been put to the test in space and his work has guided robotic spacecraft to other planets. ATV-4 is the first spaceship to bear Einstein’s name, at the suggestion of the Swiss delegation to the European Space Agency. Einstein was born in Germany but studied and spent his early career in Switzerland. Lifting off from the jungle spaceport along South America’s northeast coast, ATV-4 soared spaceward with Europe’s largest-ever load of dry cargo for the station. Packed with science experiments, crew supplies, a 3D printed tool box and even copies of Einstein’s manuscript explaining the foundation for the general theory of relativity, the craft is destined to dock with the orbiting laboratory on June 15. 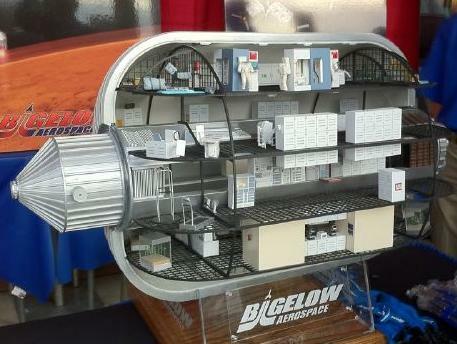 The inflatable Bigelow Space Station has been talked about for years. We are hoping that this 2015 date becomes a reality. SpaceX could launch an $18 million Bigelow inflatable module to the station from Cape Canaveral as soon as mid-2015. Another look at life in space. This time how a candle burns aboard the International Space Station (ISS). A comparison between the combustion of a candle on Earth (left) and in a microgravity environment, such as that found on the ISS.